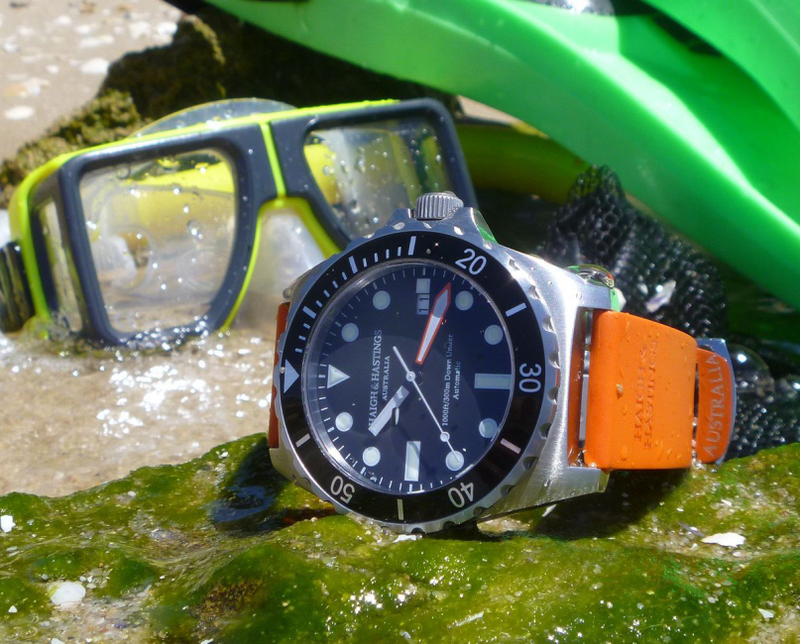 The Australian Haigh & Hastings has taken off this week and their first watch, the M2 Diver Automatic can already be ordered from their website. As you will see in the following images, the M2 Diver is carefully crafted and the young brand — already a partner of the Western Force rugby team and having as brand ambassador the famous Australian chef, Mark Olive — is on fast track to become THE Australian sport watch brand. 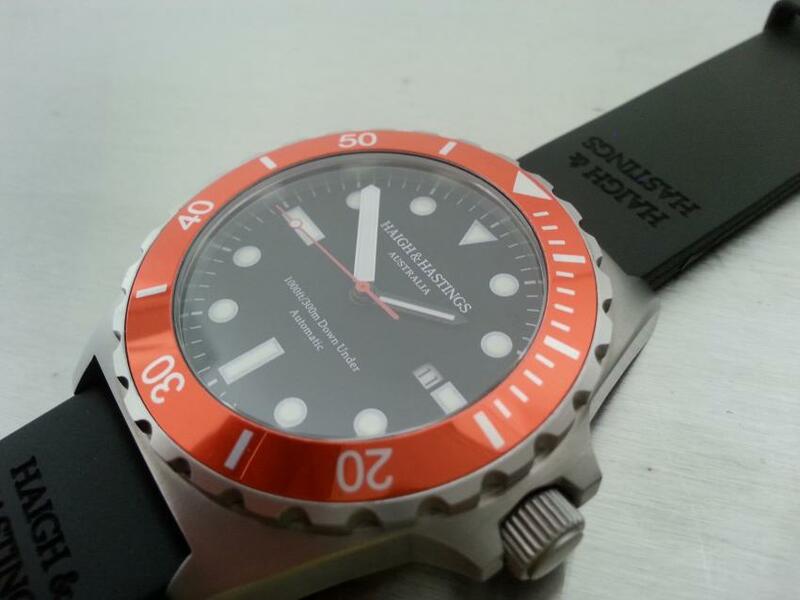 The 44 mm stainless steel case is water resistant to 1000 ft / 300 m with a 7 mm screw down crown and engraved case back. The high-contrast 40 mm dial has a block style hour hand and a plongeur style minute hand, sweep second hand and date display at 3 o’clock . The dial is covered with a sapphire crystal. The watch is powered by a 24 jewel automatic movement is beating at 21,600 vibrations per hour, with manual winding and hacking feature. When it comes to the strap you have a wide selection from the basic black strap and buckle to 12 different colours and you also can chose, depending on the style, between buckle or locking dive clasp. 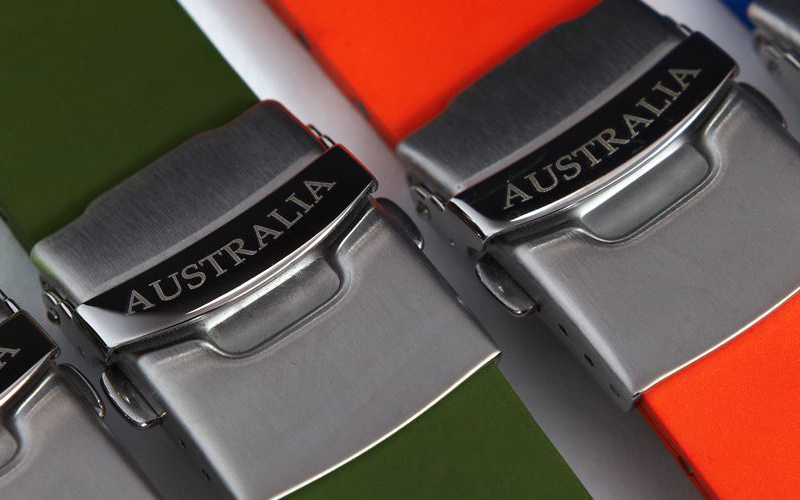 These natural rubber straps are coming from Europe and they are non-allergenic, being salt, UV and odour resistants. Price, depending on the style, between AUD $522.73 and $544.55 . It’ll come to about the same in CAD and in USD it’ll be around $470 to $500. Free worldwide shipping. 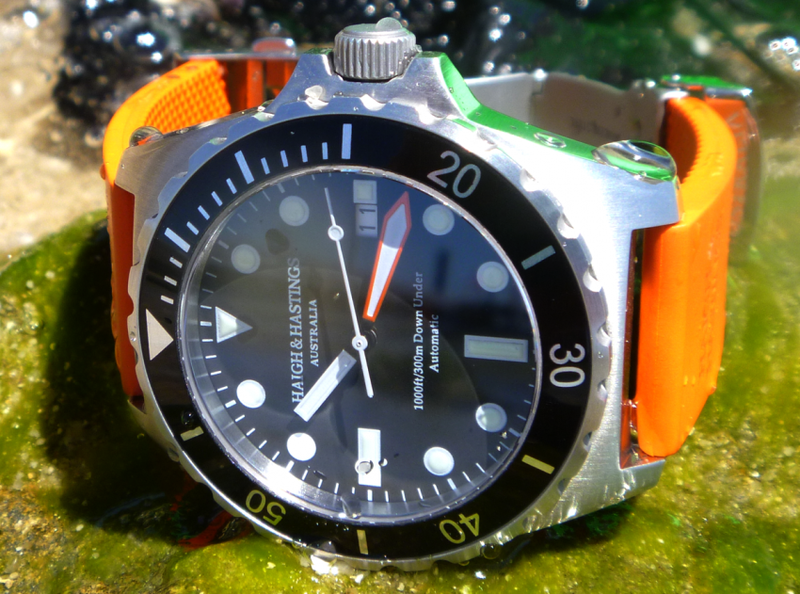 Haigh & Hastings M2 Diver Automatic, designed to explore great depths. 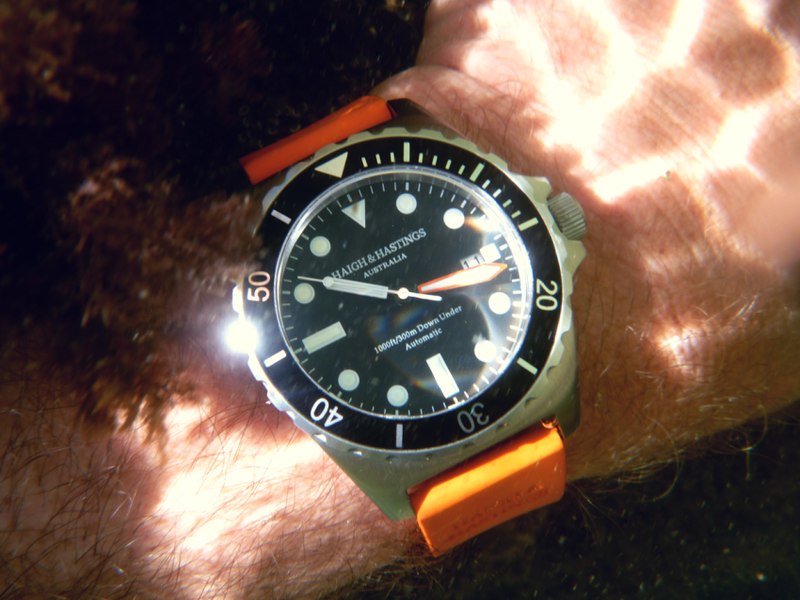 The M2 Diver Automatic in its element, under water. 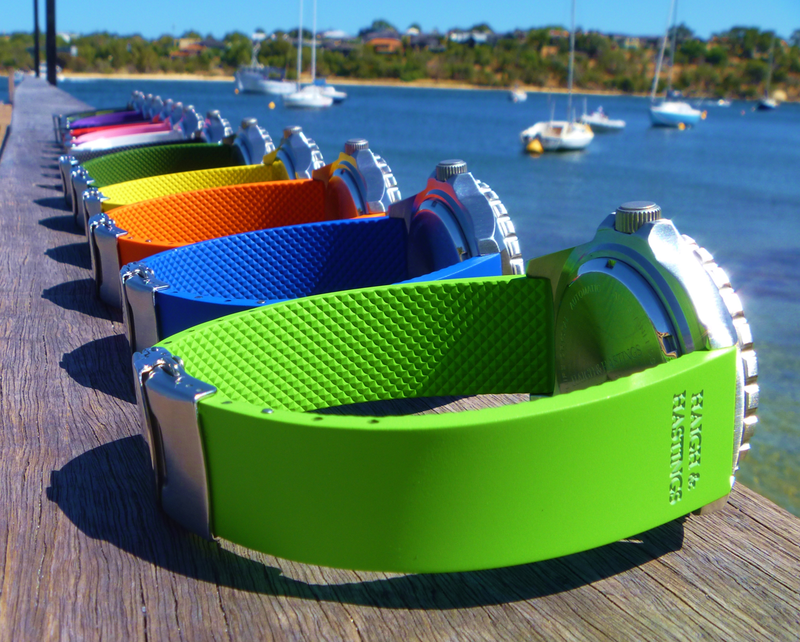 The sporty and colourful lineup of M2 Diver Automatics longing for water. From this angle they look like swimmers lining up at a competition, ready to jump in the water. A closer look at the stainless steel clasp on the M2 Diver Automatic. Thanks to the kind people at Haigh & Hastings, here is the prototype of their upcoming model, the M2 Redhead.